The second and third tranches of John Pemberton’s plate records cover the years 1956 Aug. to 1958 Aug. Many extra details have been added to John’s basic entries of these selected from about 5,000 total entries for those years – but if any reader can add details which are not yet showing, or correct errors, that will help to improve the science! Even plate colours would be of interest in some cases. Please just ‘Comment’ below. The selections were made from the thousands noted, based on rarity at the time, interesting numbers, or unusual vehicles, but are otherwise arbitrary. As European plates were predominant in John’s sightings, only odd examples and unusual series have been selected for these sheets. We hope you will enjoy delving into these pages of history! When I saw A-6147 passing me, I was flummoxed. I had to visit the library to find out where ‘Aruba’ was to be found on an atlas! Some weeks after seeing it on the grey Ford 100E Anglia at Hyde Park Corner, I saw, from the top deck of my passing double-decker, an identical car bearing shiny, brand-new VXD 44 British plates, parked in Fulham. Swiftly dismounting, I hunted the owner within nearby houses, in the sure belief it was the Aruban car, recently re-registered in Britain. 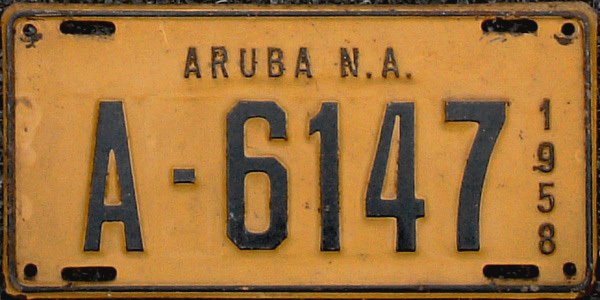 It WAS – the previous week – and the amused owner handed me one of his Netherlands Antilles plates, which I still value among the most unusual plates in my collection. Sadly, no picture ‘on the car’. Brumby archive. On the same day A-6147 was first sighted, I made another ‘country-catch’ on Ford Consul Mk.1 A 4167, which carried a cast-alloy black ET oval with ‘Anglo-Egyptian Sudan‘ printed round the perimeter. (How bizarre that the registration was an anagram of the Aruban Ford! ) John Pemberton also saw this vehicle on another day visiting London, but neither of us got photos, unfortunately – particularly as the ‘A’ registration format did not match what I know of Sudan plates of the period. Any thoughts? There were to be several more joint sightings as the years progressed, which we will share with you as the Pages proceed……. This entry was posted on Thursday, June 13th, 2013 at 1:12 am and is filed under Historic, LISTS, Netherlands Antilles, Sudan. You can follow any responses to this entry through the RSS 2.0 feed. You can leave a response, or trackback from your own site. Thanks again, Vic, for all these fascinating glimpses into the past. 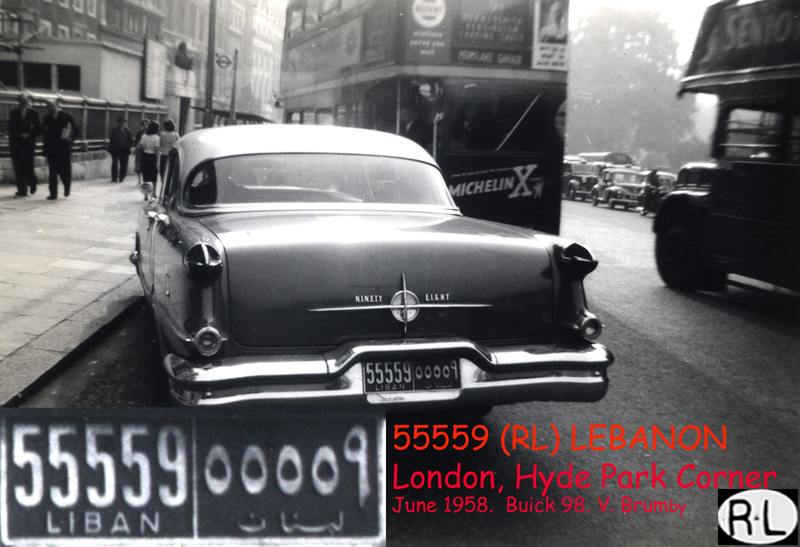 Just to set the automotive record straight, however, the Lebanese “Buick Eight” in question is actually a 1956 Oldsmobile Ninety-Eight… note the NINETY EIGHT on the trunk—sorry, boot—lid. You’re absolutely right, David! Even my own proper notes give it as a Buick – so much for extemporising when freewriting! !